Want to start shunning coffee shop prices and make your own morning brews at home? Coffee machines seem a bit large/overpriced/complicated for what you need? A cafetière could help you take things back to basics, yet produce a quality brew time and time again. Or perhaps you want to make your coffee in a green, eco-friendly way which won’t only keep your costs down but also means you’re doing your bit for the planet, with no waste produced. More goes into choosing the right cafetière for you than you’d think, including how much coffee you need to make and how long it will need to be kept warm for. With two sizes available, this Topelek cafetière is entirely made from stainless steel to prevent any future rusting or metallic taste to your coffee. The double layer vacuum wall retains the heat of your coffee for longer, so you can make a full flaskful in the morning and go for another cup after you’ve finished, and still be greeted by a warm beverage. We calculated that it keeps the coffee warm for around 20 minutes, which is sufficient enough for any refills. Due to the material, there is no glass to allow you to see the drink, which seems strange at first and is unlike the traditional cafetière design, but we think it is great to prevent any breakages or cracks which sometimes develop with prolonged use or when in clumsy hands. Pouring the coffee from this french press is ridiculously easy, thanks to the U-style spout which prevents any spillages and helps to direct the coffee into the mug. There were no drips or breaks/speeding up in the flow either. Just remember to line up the ‘dip’ part of the press with the spout to prevent messy pouring – which we found out the hard way first go. The only little niggle is that you can’t see how much is left in the pot without looking into the jug and calculating it, which was slightly more annoying than we imagined it would be. But once you get frequent use out of it, it should be easier to calculate and keep on top of all the pouring. The ultra-fine mesh filter meant there was absolutely no sediment left behind in the coffee though, even with finely ground beans, which far outweighs any negatives in our opinion. Bodum is the big name when it comes to cafetières and insulated travel mugs, being one of the first companies to develop and popularise the design way back in the 1950’s. This knowledge, along with their simplistic, aesthetic styling, makes them a firm favourite with coffee press fans. The design is simplistic, with a large plastic handle and frame which is all heat resistant and keeps the bottom of the jug safe from any knocks or damage. Having a glass body means it is easy to see the contents of the cafetière, and you can watch it on its brewing journey. This glass is heat resistant and durable to limit the risk of any accidents, but you do still have to be gentle with it. It seems much sturdier than cheaper imitation cafetière glass, anyway. All parts of the jug are dishwasher safe, or you can wash by hand if you prefer to treat it a bit more delicately. The stainless steel filter makes pressing the coffee a breeze and rids the sediment away easily. Available in black, off-white, red and bright green, it is the perfect choice for anyone who wants to add a pop of colour to their kitchen or blend in with the decor. Getting the filter into the French Press can be a bit of a trial with the first few goes, as the handle of the jug sticks above and out of the glass slightly. The lid can therefore only go on one way, but it soon becomes the norm after a few uses. The handle is very sturdy and easy to grip though, so it’s a niggle we can all live with. If you want to get the 3 cup model as you’ll be making 3 large cups at a time, we’d actually recommend getting the size up – we’d say its ability to make even 2 large cups is a bit of a push. Another stainless steel model, which is double-walled for extra insulation and very easy to keep clean. Metal jugs are also less likely to break, and there is less likely to be any taste or colouring left behind over time. Despite the insulation, the handle is cool to touch so can be held comfortably even after the boiling water has just been poured into the jug. Some cafetières which promise to keep the coffee warm for long have slight design flaws, such as the heat escaping from the pouring spout or the lid not sealing as greatly as would be expected, but with this model, you can turn the lid and lock in the heat. It also acts as a great anti-pouring safety aspect to prevent accidents. Cleaning is easy enough, as it can be placed in the dishwasher thanks to the metallic build. It can also be washed by hand with warm water, rinsed and left to dry naturally to prevent any watermarks being left. A little extra that we all absolutely loved was the measuring spoon included, which doubles up as a bag clip. This keeps your open bag of coffee fresh, as well as everything being in one place, so you’re good to go in the mornings without scrambling around trying to find everything. The fact it is 100% plastic free will no doubt appeal to a lot of people, and brewing is short at only about 3 minutes. Again, the 3 cup will only provide you with just over one standard larger mug of coffee, so go for the 6 cup. Just be aware not to push down the filter too quickly, or it makes a horrid scraping sound if it isn’t full to the top with liquid. You’re quite happy using your pod coffee machine or an instant blend when it is just you having a coffee, but when the family is all having a cup at the weekend, or you have guests over, sometimes the finest quality is all that will do. Most of the cafetières we have featured boast they make either 3 or 8 cups, which turns out to make 1 or 4 mugs. And as we all love a big mug of coffee rather than a measly cup, this isn’t great. Thankfully, this model goes up to a generous 1.5L version, which gives you 12 cups or around six mugs. It is available in copper, black or black/chrome, the latter of which we particularly liked thanks to the contrast between the colours. The glass is obviously breakable if it isn’t cared for and handled properly, but with the correct care and cleaning it will look like new for a long time to come. The metal frame is a bit loose around the glass, meaning it can spin slightly when you go to move it, but on a positive note, this seems to make it easier to take apart and clean when the time comes. Lining up the filter with the spout is also tricky at times, as it doesn’t seem to always slot into place the first time when moved. But once it is all set, the pouring is hassle-free, and there is none spilt thanks to the speed it pours. If you’re after a large capacity French Press, then this Bodum model is a fine pick. 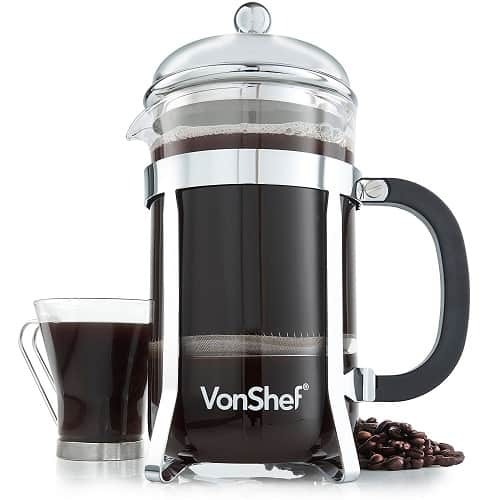 Able to make 8 cups of coffee or 4 mugfuls, this VonShef cafetière produces great tasting quality for a bargain price. Firstly, there are four mesh screens provided, and the unique double mesh system provides a stronger and more durable filter for a smoother brew. You can choose only to use a single mesh if you prefer the texture, however. This option also makes it suitable for not just coffee, but tea as well. If you’re trying to rid tea bags and teapots out of your life and go for something fresher, this is a great all-rounder. Not only is the glass pretty sturdy, but the frame is made from stainless steel and is strong, providing a great base, so the glass doesn’t come into contact with any surfaces. It also means the jug is removable from the base really easily, unlike with a lot of other models where removing it could risk breaking the glass if you’re a bit heavy handed. To keep it clean, VonShef recommends cleaning it straight after use to prevent any build-up of product or bacteria, and washing by hand as it is all quite delicate. It is suitable for the dishwasher if this is something you want to risk, though. The coffee doesn’t stay warm for long and seems to start cooling down pretty much as soon as it is brewed. You’d have to drink the second cup not long after the first to keep it warm, but as the smaller version only manages one generous-sized mug and the larger one copes with about four, there probably won’t be much left after you’ve poured your first cup anyway. Providing aesthetics as well as high-quality coffee pressing, the Gazetaro I by bonVIVO is an elegant and functional addition to any kitchen. Available in copper, silver or gold, there is an option for anyone and any decor. This metallic sleeve only acts as an outer to the glass insert jug, which feels strong enough to withstand regular use and hot water. Size-wise, there are two options available. As with most 350ml options, you can get three very small cups of coffee out of it or about one large cup (two at a push). The bigger size is the best option for anyone who may occasionally be entertaining or for multiple people, but still only manages about five big cups at one time. The plunger and lid didn’t feel overly secure when fitted, especially compared to the other models, and it all has to be positioned correctly in order to pour. Contrast this to some similar-priced models where it feels a bit more natural and seamless to all fit together. Another slight issue was the fact that water got trapped in between the glass and sleeve when washing, which we feel could become a problem over time if it doesn’t get thoroughly dry. It also left some marks which were visible from the inside. We did like the curved, full handle though, which was easy to grip and hold to pour. With a brand name such as La Cafetière, we had high expectations surrounding this product. With a model name such as Thermique, we also had high expectations regarding its thermal capabilities. Regarding its capability for the latter point, the insulation seems really effective at keeping it warm for around an hour, without transferring any of this warmth to the outside of the jug so it is always easy to get a hold of and won’t burn your hands. The company’s claim that it keeps liquid warm for three times longer than most other models probably isn’t far off the mark. Style is also an important factor for a lot of people when buying an appliance such as this, which will likely sit on your countertops for all to see. The Thermique is available in three bold metallic colours – silver, gold and copper – so there will be an option for the vast majority of kitchens around the country. Although we will say that the brushed gold is indeed very gold, so not good for anyone who likes subtle hints. Overall design is quite chic and unique, with a rounded top and long, slimline and tapered build. There is a special cloth included in the box for polishing the outer metal after you have washed it, to prevent any watermarks from damaging the shiny finish. Fingerprints also make a bit of a noticeable dull mark. In terms of pouring, it can be a bit hit and miss. Fuller jugfuls can cause a few little spills and drips here and there, but it certainly doesn’t border on dangerous. It is hand-wash only, presumably to prevent the exterior dulling, but this isn’t a massive strain on time or effort. Le Creuset is synonymous with their kitchenware, producing quality items which are designed to really stand the test of time. Whether you have other products from the range which you want this to match, or just love the idea of a long-lasting cafetière and having something a bit different, there are so many reasons why it is a perfect choice. Firstly, it is incredibly strong and durable. Despite being made from clay, the enamelling means it will resist getting chipped, damaged, or scratched with little knocks. It also won’t absorb either colouring or flavouring, so you have a clean, hygienic and fresh-tasting brew each and every time. It isn’t insulated, like the majority of other cafetières, so heat only lasts about 15 minutes. Stoneware does stay warmer than glass or metal in general, however. Purchasing a cosy to fit over the top of it could help with this if it is a problem. As it is stoneware, it isn’t completely resistant to breaking. It will smash if it is dropped onto a hard surface, or falls over on the bench. The handle is also quite hard to grip, as it is very thin and curved like a mug handle. We found it a bit difficult to lift and pour when it was completely full, so its capability to make four mugs may have to be adjusted for anyone who finds it hard to control. The colour choices available are some of the strongest, though. The Almond, Satin Black, Teal, Cerise, Volcanic (orange) and Marseille Blue all look brilliant, and would really add something to any kitchen. If you do go for this choice, make full use of the 5-year guarantee. A modern, elegantly designed cafetière which is perfect for both coffee and tea leaves, as well as milk frothing. The glass is really thick, so there is a good level of heat retained in the jug, and it won’t shatter or become damaged if treated with care. One important factor to take into consideration when cleaning is that due to the fact Lsydnfow recommend you wash it straight after use, use warm water if the glass is still warm. Cold water will cause it to wither crack straight away, or become brittle over time. It is also suitable for use in the dishwasher once cooled, however. The stainless steel surround is very simplistic, which we love. The design is all essentially in the addition of the coffee. A chrome plated lid and plunger also look the part. With a four-level filter which keeps tight to the surround, there is very little sediment which enters your cup. A stainless steel spring also prevents the plunger from breaking or cracking the glass with each plunge. It is a good size for travelling or taking on holiday, with a generous amount of coffee offered and a substantial surround which will protect it from the elements. Apart from this, there isn’t really much to say! It is an effective product which does the job without any fancy gimmicks or extras while still looking great. Yes, it is expensive for what it is. But that is the price to pay if you want a cafetière which doesn’t only look great but is designed by top-end designers. In this case, the designer is the late Michael Graves, and we think he did an outstanding job. It certainly doesn’t look like any other cafetière on the market, and the slate blue handle adds an extra touch. The handle and lid knob are made from polyamide nylon, so will always remain cool to touch, and the 18/10 stainless steel outer is incredibly shiny and easy to keep clean. A glass jug insert is removable from the entire base and sleeve for easy washing, although it does seem on the thinner side than some other models so extra care would be needed. Perhaps a case of style over substance. Not to say it isn’t brilliant at its job, because it really is, but it doesn’t necessarily do a better job than some of the other models which are a quarter of the price. You are paying for the quality, designer touch plus the name in this case. But if you want the best money can buy for your kitchen and think this will look the part, then it is a great option. It is a coffee brewing device which combines ground coffee with hot water and allows it to blend, before being served. Most allow the coffee to stay warm for a certain time period. They don’t require any electricity or extra appliances to work, so are a popular choice for anyone looking to save energy and money, as well as anybody looking for a device which they can take on holiday or camping etc. Pour the ground coffee into the bottom of the cafetière (usually around one spoonful per cup), and then pour hot water over the top. After about four minutes (or the recommended time), press down on the plunger, so the mesh/filter separates all of the coffee grounds from the rest of the water for a smooth brew. The grounds will be held at the bottom of the jug, but not compressed which is important as not to release any bitter taste. Coffee will stay warm for an amount of time in the jug. This can be anywhere between 10 minutes and an hour but is if it held too long it could become bitter. The price of cafetières can vary widely, from around £10 to over £100. There isn’t much difference in the way they operate to change the price. To find the best one for you, look out for how many cups it will prepare, how long it keeps the drink warm and also how well the mesh/filter works. The price may increase for more well-known brands, or for larger/more substantial models, so think about how often you’ll be using it and your lifestyle. What is the difference between a cafetière and a French Press? There is no difference; they are just interchangeable terms. You may also see them referred to as a press pot, coffee press or coffee plunger. The name cafetière comes from the French “cafetière à piston”, and is the name most commonly used in the UK and Europe. 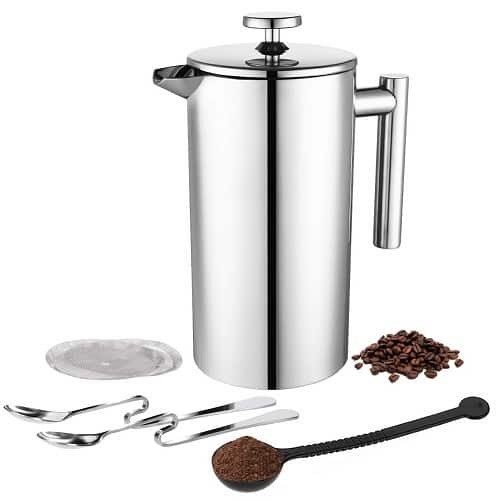 It is most commonly referred to as a French Press in the USA and Canada. Most companies will choose one version to market their products over another. Bodum have registered ‘FrenchPress’ as a trademark in certain parts of the world, as the original inventors of the product, for instance. What is the best coffee for a cafetière? All coffee presses require ground coffee to work and blend with the boiling water. Most users recommend that you use a slightly coarse ground, as a fine blend may leave sediment behind if it can get through the filter. Pre-prepared ground coffee usually states if it is suitable for a coffee press or whether it is just for machines. If you want to grind your own coffee, you may like to experiment to see which works best in terms of flavour and texture. What is the best temperature for the water? Most manufacturers recommend between 93–96 °C. This won’t only be suitable for the jug, but will also provide the best taste for the coffee. It needs to be warm in order to blend, but too close to boiling point, and it can damage the taste of the coffee. How do I clean a cafetière? Most can be cleaned by hand in warm soapy water and rinsed well. You may have to take some of the cafetière apart in order to achieve a full clean, such as removing a glass container from the outer stainless steel sleeve. There are some models, in particular the fully stainless steel ones, which are dishwasher safe. If yours is particularly delicate or breakable, dishwasher cleaning may not be the best option.